The team celebrates after the final team selection slam at the Cantab. Photo by Marshall Goff. Hailing from Manchester, New Hampshire, Mckendy Fils-Aimé had already competed three previous times at the National Poetry Slam, representing Slam Free or Die (2008, 2010) and Worcester Poets’ Asylum (2009), and he was a finalist for the 2011 Boston Lizard Lounge poetry slam team. In January of 2011, he toured the country as part of a poetry quartet called No More Ribcage. Some of his work can be found literary journals such as Amoskeag, Radius, Smashcake, and Borderline. Mckendy was the top scorer in the 2011 Team Selection Slams. 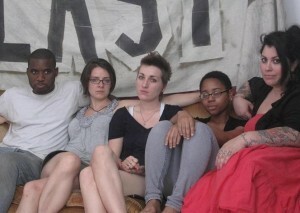 An extremely serious portrait of Team Feelings after practice at the Whitehaus. Photo by Rachel McKibbens. Although Rachel McKibbens considered the Cantab her east coast poetry home for the summer, she actually spent hours of train time commuting twice monthly from Rochester, N.Y. to practice and slam with the team. She is a New York Foundation For The Arts poetry fellow, the 2009 Women of the World Poetry Slam Champion, and the author of Pink Elephant (Cypher Books, 2009) Her poems have appeared in numerous journals, including The American Poetry Journal, Monkey Bicycle, Wicked Alice, and 580 Split. This was her ninth slam team. April Ranger represented the Cantab at the Individual World Poetry Slam in 2009 and 2011 and performed as a member of the Cantab’s National Slam team in 2008 and 2010. Her poetry has been published in Off the Coast and Muzzle. 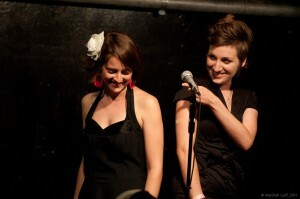 April and Carrie gear up to perform "The Other Woman" at the team's feature at the Cantab. Photo by Marshall Goff. In the twelve months leading up to team selection, Carrie Rudzinski toured the United States three times, represented the Cantab at the Individual World Poetry Slam and the National Poetry Slam (both in 2010), had her first collection of work published by Bicycle Comics, and ranked 14th in the world at the 2011 Women Of The World Poetry Slam. In her spare time, she continues to travel to other countries and sleep in unusual places. Maya Phillips is a native New Yorker pursuing a degree in Writing, Literature, and Publishing at Emerson College in Boston (2012). She was a member of Emerson’s 2010 and 2011 CUPSI teams and is the current curator and SlamMaster of Emerson College’s slam series. She splits her time between the Boston and New York poetry scenes. This was Maya’s rookie year at the NPS. The 2011 Cantab Slam Team was coached by Brian S. Ellis and Simone Beaubien. They were eliminated after preliminary competition in the competition. Carrie Rudzinski represented the team in NUPIC competition and placed runner-up to independent slammer Rachel McKibbens.